I've posted photos of some of the most beautiful churches in France. You don't see anything more breath-taking than Ste. Chapelle or more historic than Notre Dame. But this is my favorite 'church,' Monday worship with my Anglican friends. As an Episcopalian, I knew it would be difficult to worship here in the Lot. I've attended Mass locally, but since my French isn't very good, I understand very little of the service. And not being Catholic, I feel uncomfortable taking communion when I know it isn't okay with a lot of priests. There is an Anglican Chaplaincy based in Toulouse, and services are held in Cahors. That's over an hour's drive and I confess, I've never been motivated enough to go on Sundays. But, the Chaplaincy does sponsor home study groups which meet for worship in various people's homes. My group meets the first and third Mondays of the month. 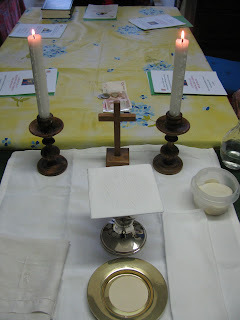 On the first Monday, a priest comes to offer us communion; the third Monday is a morning prayer service. This Monday we met at John's in Caylus; June presided. We sat around a table in the basement, heard a homily on the Magi, sang two Epiphany carols a capella, and after June blessed the elements, we offered each other the Eucharist. Simple and heart-felt with a feeling of close community... a lovely way to worship. Sounds very lovely indeed! All the pieces sound very pretty, acapella voices can be so moving. I have to admit that I'm not a believer. But if I were, the simple worship you describe would suit me best.